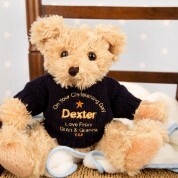 This cute and soft teddy bear is a great gift for a baby boy's Christening. 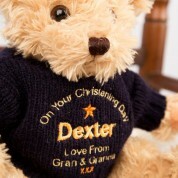 The bear comes complete with his very own navy blue jumper, which is embroidered with the text "On Your Christening Day" and a star symbol below. It's personalised with the baby boy's name, and a sweet personal message from yourself. 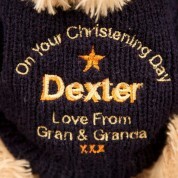 It will look lovely sitting on display in his bedroom, reminding him of his special day. Please note this bear is not a toy, and not suitable for children under 36 months. Dimensions: Approx 22cm tall when sitting. Not Jointed. Weighs approx 135g.